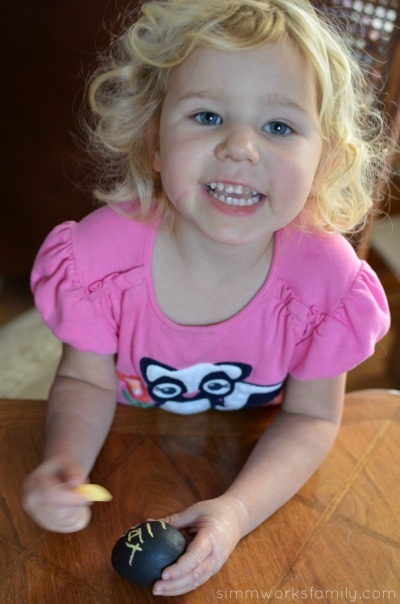 My kids love that they can write their own Easter egg designs on the eggs and then wipe them off and start again. And it’s a great way for the kids to practice writing their names! 1. 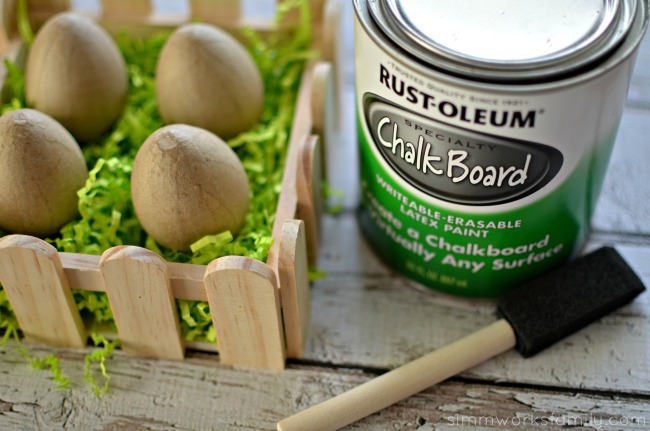 Paint a thin coat of chalkboard paint onto eggs. Let dry. 2. 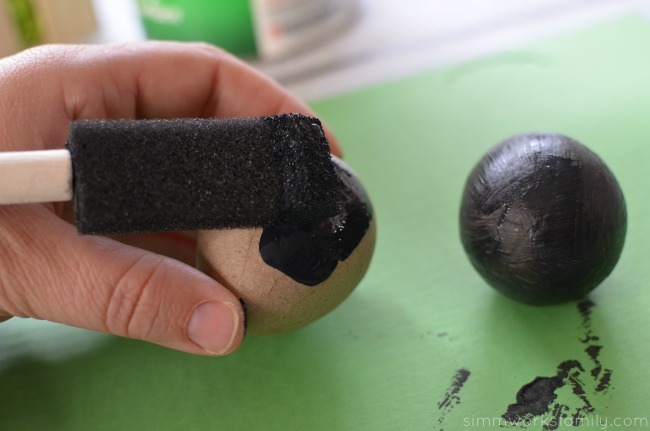 Apply a second coat so that the eggs are fully covered and none of the egg underneath shows through. Let dry completely. These eggs also serve as the perfect place setting for your Easter brunch or dinner. Simply write each guests name on an egg and place in an egg holder or egg carton and display at the top of each place setting! Love this idea. So cute and can be used for years to come! These are genius. My 3 year old would love these as an Easter gift. She’s been working on writing the letters in her name, and this would be a fun way to practice. These are cute! Great idea. What a clever idea – and they’ll be available year after year. I love your “local artist.” She’s adorable! Thanks! Yes, that’s what I love about them too. We can keep bringing them out every year. I love this. You are ridiculously creative! This is such a fantastic idea. What a great way to keep the mess down without taking the fun out of Easter Egg decorating. I love this idea!! I’m going to try then with my yard eggs this weekend. What a sweet idea. I never would have thought of this. Your daughter is the cutest! I never would have even thought about this. Genius idea! Love it! 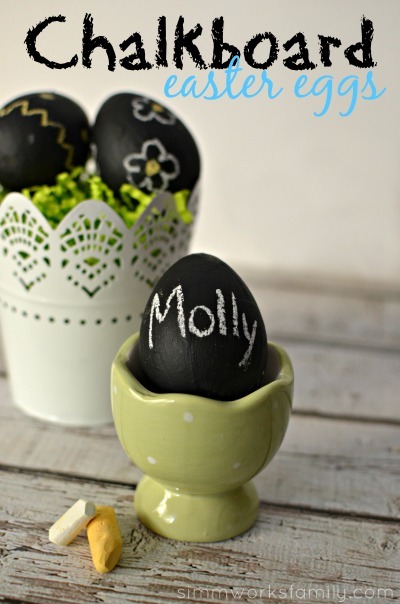 The chalkboard eggs look like so much fun to make and are a super cute centerpiece. How creative is this! 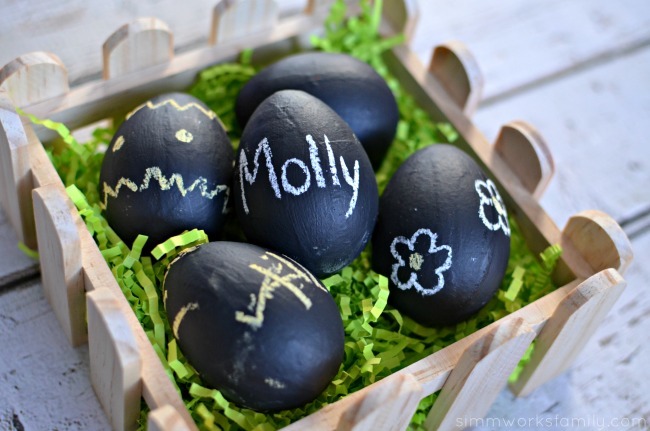 The chalkboard eggs look so much fun to do! Great idea! This is such a simple project that can really be great for learning, or even table-setting this Spring. I love it! This is a brilliant idea. I can use these as center pieces for Easter Dinner! Thanks!! Now that would just be silly 😉 Haha!